Fr. Thomas Rosica is a priest of the Congregation of St. Basil (Basilian Fathers). He was born in 1959 in Rochester, New York [USA]. After attending elementary and secondary school in Rochester, he received a Bachelors of Arts in Italian and French Language and Literature from St. John Fisher College in May 1980. Fr. Rosica was ordained a priest in the Congregation of St. Basil on April 19, 1986 in Rochester. He holds advanced degrees in Theology and Sacred Scripture from Regis College in the Toronto School of Theology , the Pontifical Biblical Institute in Rome  and he is Elève Titulaire de l’École Biblique et Archéologique Française de Jérusalem . Fr. Rosica lectured in Sacred Scripture at Canadian Universities in Toronto, Windsor and London from 1990-2008. From 1994-2000 he served as Executive Director of the Newman Centre Catholic Chaplaincy at the University of Toronto. From 1994 – 2006, Fr. Rosica represented the Canadian Bishops on the Canadian Christian-Jewish Consultation. In June 1999, he was appointed by the Canadian Conference of Catholic Bishops as the Chief Executive Officer and National Director of the World Youth Day and the Papal Visit of Pope John Paul II, that took place in Toronto during July, 2002. On July 1, 2003, Fr. Rosica became the founding Chief Executive Officer of Salt and Light Television, Canada's first national Catholic Television Network. From 2003 – 2006, he also served as Master of Scholastics of the Basilian Fathers in Toronto. In August 2006, he was elected to the General Council of the Congregation of Priests of St. Basil and served for four years as Second Councilor. In October 2008, Fr. 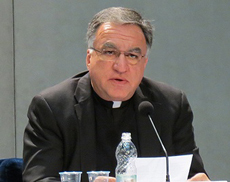 Rosica was appointed by the Vatican as the English-speaking Media Attaché of the Synod of Bishops at the Vatican that focused on "The Word of God in the Life and Mission of the Church." In February 2009, Pope Benedict XVI appointed Fr. Rosica a Consultor to the Pontifical Council for Social Communications. The Vatican appointed him once again to be the English-language Media Attaché of the Synod of Bishops on "The New Evangelization" that took place during October 2012 at the Vatican. He also served as English-language Media Attaché at the October 2014 Extraordinary Synod on the Family and the October 2015 Ordinary Synod of Bishops on the Family. In October 2018, the Vatican appointed Fr. Rosica to the Commission for Information of the Synod of Bishops on “Young People, the Faith and Vocational Discernment” that took place in Rome during the month of October. From December 1, 2011- until June 1, 2015, he served as President and Vice-chancellor of Assumption University in Windsor, Ontario. Following the announcement on February 11, 2013 of Pope Benedict XVI’s resignation, Fr. Rosica was invited by the Vatican to join the staff of the Holy See Press Office and serve as one of the official spokespersons for the transition in the papacy that included the resignation, Sede Vacante, Conclave and election of the new Pope. Fr. Rosica assisted the Vatican during a critical period in Church history. At the end of the Papal transition in April 2013, the Vatican asked him to serve as English language assistant to the Holy See Press Office. From 2013 to the end of 2016, he served in this capacity on behalf of the Holy See Press Office. Fr. Rosica has received awards from the Governments of Italy and Israel, and two Jubilee Medals from Queen Elizabeth for his work with young people. In 2003, he received the Papal Award "Pro Ecclesia et Pontifice" from Pope John Paul II for his leadership of World Youth Day 2002. In January 2014, he was awarded the John Carroll Medal from the John Carroll Society in Washington, DC. In May 2016, Fr. Rosica received the St. Francis DeSales Distinguished Communicator Award from the DeSales Media Group of the Diocese of Brooklyn, New York. That same month, he was awarded a Doctorate of Humane Letters Honoris Causa by Niagara University in Niagara Falls, New York. In June 2016, he was inducted into the Hall of Fame of Aquinas Institute of Rochester. In May 2018, Fr. Rosica was awarded a Doctorate of Sacred Letters, Honoris Causa by St. Mark’s College at the University of British Columbia in Vancouver. In November 2018, Fr. Rosica was awarded an Honorary Doctorate by Regis College, the Jesuit Faculty of Theology at the University of Toronto. Fr. Rosica is a Fourth Degree Member of the Knights of Columbus, a Knight Commander of the Equestrian Order of the Holy Sepulcher of Jerusalem, and a Senior Fellow of Massey College in Toronto. A well-known and respected biblical scholar, lecturer, speaker, retreat preacher and author, he is fluent in several languages and has served the Church at a local, national and universal level in his years of ordained ministry as a priest in the Congregation of St. Basil. He serves at Procurator General for the Basilian Fathers of Toronto.